Fashwire is a discovery and shopping marketplace democratizing the fashion industry by offering all fashion-conscious consumers, no matter their demographics or geo-graphics, a direct link to designers and fashion worldwide. Fashwire helps fashion designers with costly ordering decisions and improves on their full-price sell-through by providing instant, targeted user data and feedback on the popularity of new ranges, and even potential future products. 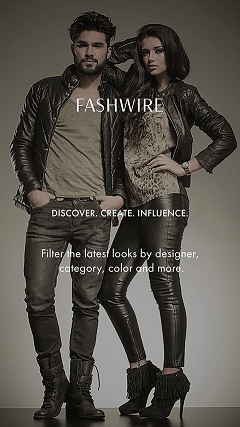 Fashwire is where brands are identified, analyzed and defined. Designers and retailers have access to an increasingly rich bank of information, allowing them to target their styles based on real-time consumer demographics and data. Our users also get an unmatched eye into the industry. As they vote on designers collections and post their own personal style to the My Wire feature, they will be influencing tomorrow’s fashion trends, getting rewarded for their time spent on the app, and offering real-time insights for designers and, by extension, retailers.